This was easy to put onto my screen. The supplied cleaning products helped me clean the screen first and the video showed me which way up to put it so I didn't cover the camera etc. Ok. The bad bit, the guide that comes with it puts it in the wrong place. The good bit. I was sent a replacement and when you see where the screen edge is you can line it up with that. Apply a bit of pressure then turn it off to create a good tight fit. Works really well with my s9 & tech 21 case. The screen stays put and is super sensitive. Would highly recommend. Just don't use the fitting tool for S9. I may have to return this item as the right side of my touch screen isn't responding because of the additional protection. This was simple to fit. Works well with my phone case. Great quality. This screen was simple to fit. No air bubbles. Covers the screen beautifully. Very pleased with purchase. Quick delivery and great site from mobile fun. The screen protector was easy to fit and no bubbles appeared. When I dropped the phone two days later it fell straight off offering no protection. Perfect screen cover for my phone. Fits snugly to the screen and doesnt affect my case. Fitting instructions easy to follow. Highly recommended. I bought this as a recommended glass protector to add an extra level of protection to my new S9. Within days of fitting it and with no impacts, drops, bumps or accidents i had noticed a serious of tiny cracks that began to spread. These cracks spread to the appearance of a shattered screen. I believed this was down to my poor fitting so bought another. Once again I followed the video instructions. This time just over a week has gone by and a tiny crack has appeared. What a waste of money. I'm now going back to the film protectors. 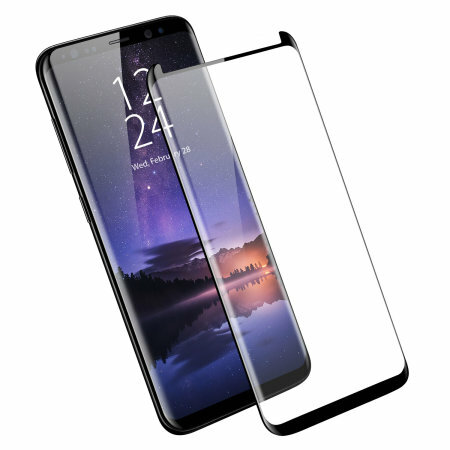 I strongly recommend spending the small amount of extra money for the Olixar Easy Fit Case Compatible Glass Screen Protector (Mobile Fun ID 66839). I bought this kit and it made it very easy to apply the screen protector precisely first time. Great fit first time. No bubbles. After adjusting the screen sensitivity in the advanced settings it works a charm. Excellent product for my s9. Total screen protection and great service,delivered within 3 days, Highly recommend.